His journey to the top of his profession was oddly uneven, mostly due to circumstance. A natural first baseman, left-handed all the way, his six-feet-four and 200 pound physique (though he got bigger) and long arms earned him the wonderfully appropriate nickname of “Stretch.” Jim Murray, the erudite Los Angeles Times columnist, once wrote, “"On ground balls hit down to the second baseman, there's no need to throw, the second baseman just hands the ball to Willie.”4 Unfortunately, when he arrived on the scene in late 1959 (in spectacular fashion) his team already had a first baseman, and a great one at that, and it took the Giants nearly seven years to straighten this all out. McCovey’s years at the top were further shortened by injuries — he had bad feet and arthritic knees and hips that caused him considerable pain and made him mainly a part-time hobbled player for the last 10 years of his career. But if he had plenty of obstacles and mishaps to overcome, McCovey managed to stick around for parts of 22 seasons, hit 521 home runs, and earn the admiration and respect of seemingly every man he came across, especially in his adopted hometown of San Francisco, California. Meanwhile McCovey had dropped out of high school a year early in 1954 to work and help the family finances. He delivered newspapers at the age of 12, and now worked in a bakery. In December he went to Los Angeles to visit his older brother Wyatt for the holidays — because his father worked for the railroad he was able to ride the train for free. Willie loved L.A. so much he decided to stay to live and work. He might have stayed for years, but his mother wrote to tell him that Alex Pompez was trying to reach him — he wanted Willie to attend a Giants tryout camp in Melbourne, Florida. The Giants sent him a bus ticket, and McCovey headed east. Despite his age, McCovey had no difficulty adjusting to professional pitching. He hit .305 with 19 home runs, 24 doubles, 15 stolen bases, and a league-leading 113 RBI in just 107 games. The next year, with Danville, Virginia, in the Class B Carolina League, McCovey kept hitting — 29 home runs and a .310 average, leading the circuit with 38 doubles. In 1957, promoted all the way to Double-A Dallas, he hit .281 with 11 home runs. More importantly, he suffered injuries to his ankle and knee while sliding into home, costing him several weeks of the season. The knee had to be punctured and drained of fluid. Although he had had a bit of speed in his first few professional seasons, with a lot of triples and stolen bases, he would generally be considered slow afoot. In 1958 the 20-year-old made it to Triple-A Phoenix, and he .319 with 14 home runs while battling knee soreness and visiting orthopedists. His teammates included Felipe Alou, Leon Wagner, Tom Haller, Willie Kirkland, and Ernie Broglio, a group good enough to win the Pacific Coast League championship. McCovey went to his first major league spring camp in 1959, but despite his impressive minor league record he had no realistic chance of making the team. The Giants, who had relocated to San Francisco, had two first baseman already: Bill White, who had had a strong rookie season for the Giants in 1956 but had spent most of the next two years in the Army; and Orlando Cepeda, the reigning Rookie of the Year, who had hit .312 with 25 home runs and 96 RBI and captured the hearts of the fans in San Francisco. McCovey wore a steel brace on his knee and saw very little action, before being sent back to Phoenix to start the year. McCovey rather emphatically forced the Giants’ hand. In late July, after 95 games, he was hitting .372 with 29 home runs and 92 RBI. That was apparently sufficient, and the Giants called him to San Francisco on July 30. “Something in the back of my mind kept asking — ‘Am I good enough?’” recalled McCovey.10 The Giants were just 1/2 game out of first place, though they had lost their last four games and had not been scoring runs. Cepeda had done his part, hitting just as well as he had in his fine rookie year. Manager Bill Rigney decided to move Cepeda to third base to get McCovey into the lineup. His first game was on July 30, hitting third between Willie Mays and Cepeda, facing Phillies ace Robin Roberts at Seals Stadium. All McCovey did was go 4-for-4 with two triples, leading the Giants to a 7-2 victory. It was one of the more impressive debuts in big league history. He hit in his first seven games, batting .467 in that stretch, including his first home run (off the Pirates’ Ron Kline) and his first two-homer game (both off Milwaukee’s Bob Buhl). On August 17 he started a 22-game hitting streak, at the end of which he was hitting .381. He finished his two-month debut batting .354 with 13 home runs. The Giants stayed in first place most of August and September, and led both Los Angeles and Milwaukee by two games with eight to play, but lost seven of the eight and finished third, four games behind the pennant-winning Dodgers. “If anyone’s immune to the sophomore jinx, it’s got to be McCovey,” Rigney said. “His hitting is fundamentally too sound. He has a near perfect swing, a picture swing, and he doesn’t go after too many bad balls.”14 Fully grown at 6-feet-4 and 200 pounds, McCovey had a tough year in 1960. At the end of May he was hitting .267 with 9 home runs, but a prolonged summer slump kept him on the bench often, and eventually to Triple-A in mid-July. His demotion was brief, just 17 games, but he continued to struggle on his return. For the season he hit .238 with 13 home runs. While his numbers against right-handed pitchers were respectable (.279, 13 homers), against southpaws McCovey hit a wretched .129 in 70 at bats. McCovey’s defense, never a strong suit, suffered along with his offense. 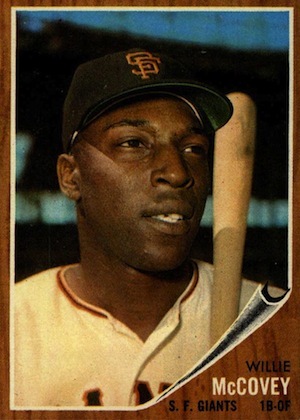 For the 1962 season, in his part-time left field role, McCovey hit .293 with 20 home runs in just 229 at bats. His .590 slugging percentage would have been fourth in the league had he had the requisite playing time. Dark had given up on him against left-handed pitchers — he started only once all year against a lefty, and he was removed for pinch-hitters nearly anytime a lefty was brought in. As a result, he played just 20 complete games. For the season he finished 3-for-10 against southpaws. In the World Series, he started four times — sitting out the three games Whitey Ford pitched. In Game 2, he homered off Ralph Terry in a 2-0 Giants win, went hitless in Game 3, singled in Game 5, and then played a central role in the finale. Just when it seemed like McCovey had settled into stardom, he had a bad year in 1964, hitting just .220 with 18 home runs in 364 at bats, including a grisly .145 against lefties. McCovey struggled with the January death of his father, his greatest influence, and then battled the first significant physical problem of his major league career — a painful and mysterious ailment to the sole of his left foot. Dark doubted the injury, which disappointed his player. “Now, why would I not want to play? It was my profession, I always wanted to play before.”21 Before the 1965 season, a special ripple sole was devised for his shoes and he was able to live with the lessened soreness. But McCovey’s injuries were just beginning. Cepeda, the team’s star first baseman, had been playing the past few years with a sore right knee. He continued to hit, averaging 32 home runs, 107 RBI and a .309 average over his first seven big league seasons. (He later suggested that he foolishly kept playing on the knee because Dark doubted his injury.) When Cepeda showed up at camp in 1965, playing under new manager Herman Franks, the swelling and pain in his knee had become unbearable, and he ended up playing just six games in the field the entire season, along with 27 pinch-hitting appearances. Franks moved McCovey back to first base, and the slugger responded with a great comeback season, 39 home runs and a .276 average. This was an offensive-starved era, making McCovey’s statistics especially impressive. He finished second in the league in homers and walks (88), and in the top five in on-base percentage and slugging percentage. The Giants remained in the pennant race until the last weekend of the season before losing to a Dodger team that won 15 of its final 16 games. When Cepeda showed up ready to play in 1966, the Giants once again had two star first basemen, one with a bad knee and the other with bad feet and two sore knees. Franks kept McCovey at first and tried Cepeda in left field for a few games, but it was soon clear that the situation had, finally, become untenable. On May 8, the 28-year-old Cepeda was dealt to the Cardinals for pitcher Ray Sadecki. Although his career would eventually succumb to his bad knees, Cepeda had a few good years left in him, including an MVP award in 1967. Significantly, neither he nor McCovey would ever play the outfield again. McCovey, also 28, had established himself as one of the best hitters in the game, but for the first time had a total grip on the first base position — the only position he could competently play. McCovey responded in 1966 with what had now become a standard McCovey season — 36 home runs, 96 RBIs, a .295 batting average — finishing fourth in the league in on-base percentage (.391) and second in slugging (.586). McCovey was playing in a league filled with all-time great players, and he was holding his own with all of them. As proof, he batted cleanup in the 1966 All-Star Game, behind Mays, Roberto Clemente, and Henry Aaron in the batting order. In 1967 he had to miss time throughout the season because of his sore knees, but he still finished with 31 homers, 91 RBIs, and a .276 average in 135 games. The Giants finished in second place for the third straight season, though this time the race did not go to the last weekend. His bag was hitting a baseball, and in 1968 he did it better than anyone else in the game. In what became known as the “Year of the Pitcher,” someone forgot to inform McCovey, who hit .293 and led the NL with 36 home runs, 105 RBIs, and a .545 slugging percentage. Jim Maloney, Cincinnati’s ace pitcher, understated the case when he called McCovey “the most feared left-handed hitter in the National League.” Because all his fellow hitters had struggled to score runs over the past few years, after the season the major leagues agreed to lower the pitching mound and reduce the size of the strike zone. The Giants were involved in yet another tight pennant race, this time in the brand new NL West. Herman Franks had been replaced by Clyde King, a move that suited McCovey well. "I don't think," he said, "that I've ever met two men anywhere who have such opposite views about handling players. Herman was the type who hated to build a player up. Clyde, well, he's always around with the compliments to everyone. Ballplayers, like everyone else, like to get told they did something right." 24 (Franks was Mays’ friend, and the longtime star and team leader did not take to the switch as well as McCovey did.) The Giants were in first place as late as September 22, but ultimately finished three games behind the Braves. One of the biggest thrills of McCovey’s career was the 1969 All-Star Game, played on July 23 in Washington’s RFK Stadium. Batting fourth in the NL lineup, McCovey hit two long home runs, one each off Oakland’s John “Blue Moon” Odom and Detroit’s Denny McLain. He finished 2-for-4 in the NL’s easy 9-3 victory, after which he was named the game’s Most Valuable Player. After the season, he was named the NL MVP for the season in a close vote over the Mets’ Tom Seaver, who won 25 games for the surprising world champions. The 1970 Giants started slowly, causing the club to replace King with Charlie Fox, though nothing could help them catch the red-hot Cincinnati Reds. McCovey had another great season, batting .289 with 39 home runs and 126 RBI, leading the league in walks (137), intentional walks (40), and slugging percentage (.612). He showed up in 1972 healthy and raring to go, and homered on Opening Day off Houston’s Don Wilson. In the season’s fourth game, San Diego’s John Jeter ran into McCovey at first base, fracturing Willie’s right forearm. ("I feel like I killed Santa Claus," Jeter said.27) McCovey missed nearly two months of action, and struggled mightily upon his return. In what turned out to be 263 at-bats, McCovey hit just .213 with 14 home runs. While McCovey was on the disabled list, the Giants traded Willie Mays to the Mets, which marked the start of the club’s efforts to rid itself of its aging, high-salaried players. In 1973, with two arthritic knees but a healed forearm, McCovey hit nearly as well as ever — in 130 games, many of them as a pinch-hitter, he belted 29 home runs and hit .266, walking 105 times (including a league-leading 25 intentionally). After the season he became the next high-priced Giant to be discarded, following Sam McDowell in June and preceding Juan Marichal in December. On October 25, McCovey and reserve outfielder Bernie Williams were dealt to the San Diego Padres for pitcher Mike Caldwell. "They've never had a real star here," said San Diego’s manager, John McNamara. "Now we have one who is absolutely first class." McCovey willingly took the burden. "What I do is give 100% and hope I'm setting an example,” he said in his first spring with Padres. “That's why I played so often when I was hurt.”29 McCovey hit well the next two years — 22 home runs and 96 walks in 128 games, then 23 home runs and 57 walks in 122 games — but not enough to get the woeful Padres into contention. He continued to battle physical ailments, had increasing difficulties in the field and on the bases, but still did damage when he got into the batter’s box. McNamara scheduled a couple of days off a week to try to wring as much value as he could out of his best hitter. In 1976, the 38-year-old McCovey struggled right from the start, and lost his first base job to the 23-year-old Mike Ivie. On August 30 he was sold to the Oakland A’s, which allowed him to try the designated hitter position for the only time in his career. For the year he hit .204 in parts of 82 games. With no contract for the coming season, his career seemed like it might have come to an end. He contacted the Giants, who invited him to spring training with no promise of a job. 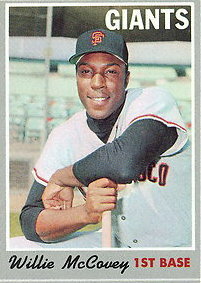 McCovey played three more seasons with the Giants, with decreasing playing time and effectiveness. He hit his 500th home run on June 30, 1978, off Jamie Easterly at Atlanta’s Fulton County Stadium. He hit .228 with 12 home runs that year, sharing the first base job with Mike Ivie, who was more effective. McCovey improved to .249 and 15 home runs in 1979, while Ivie hit 27 home runs and hit .286. When McCovey received little playing time for the first several weeks of the 1980 season, he announced his retirement, which would follow a couple of weeks of celebrations. His only home run of the season, hit in Montreal off Scott Sanderson on May 3, was his 521st, tying Ted Williams for 8th place on the all-time list. In his final appearance at Candlestick Park, on July 3, he was lavishly feted before the game, got the start, and contributed an RBI single to a Giants’ win. He was allowed to finish his career on the ensuing road trip to Los Angeles. In Dodger Stadium, the fans showered him with tremendous standing ovations. His final at-bat, on July 6, was an 8th inning pinch-hit go-ahead sacrifice fly, contributing to another win. At age 42, his wonderful playing career had come to an end. In retirement, McCovey has remained firmly associated with the Giants and with the city of San Francisco. In the late 1960s he bought a lot in Woodside, just down the peninsula from the city, and several years later he built a sprawling house on it. In subsequent years it became a beautiful and luxurious suburb, home to the mansions of many Silicon Valley millionaires, including the late Steve Jobs. McCovey has lived in the home ever since, close to his beloved Giants. He has held various positions with the club over the years: spring training instructor, special assistant to the general manager, and, most recently, Senior Advisor. His principal role seems to be showing up at the park and playing the part of beloved icon, something he is happy to do. Other than his work with the Giants, McCovey was able to make occasional money at the memorabilia and autograph shows that became so popular in the 1980s and 1990s. He got into some hot water in 1996 when he was indicted for evading taxes on income derived from these shows. He ended up paying a $5,000 fine and serving two years probation. McCovey was married once briefly — to Karen in 1964 — but the couple divorced two years later. Willie and Karen had a daughter, Allison McCovey, who in 2012 was the Chief Operating Officer of the non-profit San Francisco Pretrial Diversion Project. The injuries that brought him constant pain throughout his career got only worse in subsequent years. He had many surgeries in each knee, before eventually having each replaced. He has had four back surgeries, which have left him increasingly immobile. By 2013 he had been in a wheelchair for more than a decade, though he still gets to many Giants games every year. His recovery from his latest back surgery kept him away from the ballpark during the Giants 2010 World Series victory, but he was front and center two years later when they did it again. McCovey was inducted into the Baseball Hall of Fame in 1986, in his first year of eligibility. He has attended most of the induction ceremonies in subsequent years. The San Francisco Giants permanently retired his uniform number 44 soon after he last wore it. When the club opened their new ballpark, initially called PacBell Park, in 2000, one of the park’s most striking visual features was the China Basin just beyond the right field fence. To honor their famous slugger who surely would have hit many balls into the water, the club named this inlet McCovey Cove. In 2003, the club unveiled a statue of their icon at McCovey Point, at the mouth of the Cove. Around the statue there are plaques with the names of the winners of the Willie Mac Award, which the Giants have given out annually since 1980 to a player who displays McCovey’s spirit and leadership. McCovey spent several years playing with, and often overshadowed by, outstanding teammates, including Mays, arguably the greatest player there ever was. None of this — the platooning, the slights, the unrelenting injuries — seemed ever to affect this man, this man without enemies, who remained delightfully humble and grateful to be playing baseball, playing for the Giants. Five decades after his amazing debut, he was still there, still humble, still grateful, still smiling. He died on October 31, 2018, at the age of 80 after a long battle with many health issues. I would like to thank Steve Treder and Rob Wood for their thorough review of this article. 1 Jim Bouton with Leonard Shecter, Ball Four (New York: World, 1970), 385. 5 Arnold Hano, “The Arrival of Willie McCovey,” Sport, June 1969. 6 Ron Fimrite, “The Cable Cars, The Fog — And Willie,” Sports Illustrated, April 17, 1978. 8 Ed Scott, interview by Ron Anderson, in Jim Sandoval and Bill Nowlin (eds. ), Can He Play? A Look at Baseball Scouts and their Profession (SABR, 2011), 69. 9 Sam Whiting, “Willie McCovey recalls ’62 Series — 50 years ago,” San Francisco Chronicle, March 25, 2012. 11 Ron Fimrite, “The Heart Of A Giant,” Sports Illustrated, October 16, 1991. 13 Fimrite, “The Heart Of A Giant.”. 14 Charles Einstein, “Hey, Lay Off McCovey,” Sport, July 1963, 34. 16 Walter Bingham, “The Race Is In The West,” Sports Illustrated, June 4, 1962. 18 Charles Schulz, daily strip, Peanuts, December 22, 1962. 20 Mike Mandel, SF Giants. An Oral History (Santa Cruz: self-published, 1979), 89. 23 “San Francisco Giants,” Sports Illustrated, May 19, 1969. 24 Mark Mulvoy, “The Pursuit Of Willie And Clyde,” Sports Illustrated, September 15, 1969. 25 Mandel, SF Giants, 91. 26 Roger Angell, The Summer Game (New York: Viking, 1972), 274. 27 Jim Kaplan, “The Week,” Sports Illustrated, May 1, 1972. 28 Fay Vincent, It’s What’s Inside the Lines That Counts (New York: Simon and Schuster, 2010), 23-24. 29 William Leggett, Ron Fimrite, Mark Mulvoy, Pat Putnam, Jim Kaplan, “Familiar Faces In New Places,” Sports Illustrated, March 18, 1974. 30 Ron Fimrite, “I’ll Come Home To You, Said Willie,” Sports Illustrated, May 2, 1977.